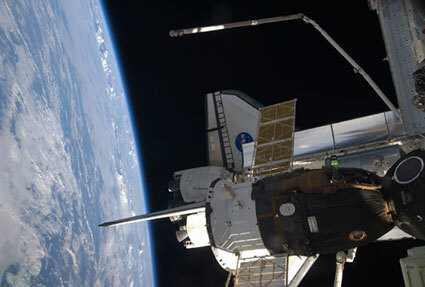 After closing the hatches between the two spacecraft last night, the two crews aboard space shuttle Discovery and the International Space Station prepare to undock today. Shuttle commander Rick Sturckow, Pilot Kevin Ford and mission specialists Tim Kopra, Pat Forrester, Jose Hernandez, Danny Olivas, and Christer Fuglesang, will focus on preparations for the undocking from the station. They are scheduled to undock from the station at 3:26 p.m. EDT. Once safely separated from the orbiting complex by about 450 feet, Ford will conduct a flyaround of the space station. The maneuver provides an opportunity to get video of the station that can be used to inspect for damage or general condition of the vehicle’s exterior. A final separation burn is expected at 5:09 p.m.
Later, the shuttle crew will again engage the shuttle robotic arm, its extension boom and cameras for a last look at the thermal protection system to check for any damage. 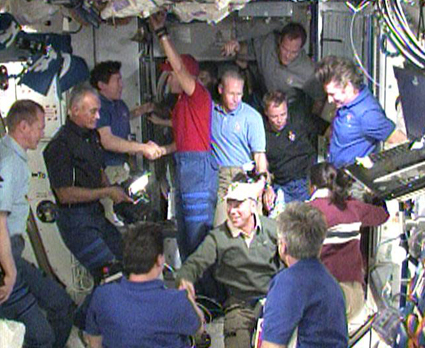 With over a week of docked operations behind them, the astronauts and cosmonauts said their goodbyes and closed the hatches between the International Space Station and space shuttle Discovery at 11:41 p.m. EDT Monday. The 13 crew members aboard space shuttle Discovery and the International Space Station completed final transfer work between the two spacecraft and returned the high-tech moving van “Leonardo” back to the orbiter’s payload bay Monday. Arriving aboard Discovery was the newest Expedition 20 crew member, Nicole Stott, who switched places with Mission Specialist Tim Kopra. Stott will handle flight engineer duties aboard the station until her return home aboard Atlantis following the STS-129 mission in November. Discussion at Nasaspaceflight. Pics and video at Space Multimedia. Check the links at right for play-by-play and NASA TV.